Skylar had it all – riches, success, and fame – until he traded it all for Enlightenment. After losing everything dear to him, Skylar vows to rediscover the timeless bliss he knew as a child. As he visits the California paradise of his glory days, he finds shaggy surfers, washed-up hippies, and a deranged Vietnam vet. Little does he know, he’s only at the beginning of an astonishing and wonderful adventure. Using the wisdom of spiritual Masters, he’s about to take a wild ride through the past, present, and future. 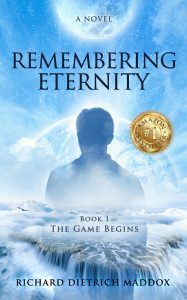 “Remembering Eternity: The Game Begins” is the first book in an inspiring series of spiritual and metaphysical novels. If you like transcendental journeys and adventures that teach and thrill in equal measure, then you’ll love Richard Dietrich Maddox’s ode to the 60s generation.